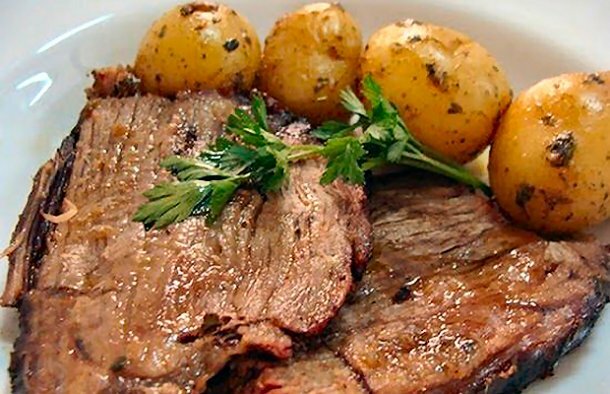 This Portuguese pot roast (carne assada) recipe, makes a sumptuous feast of beef with roast potatoes. Place the meat in a large bowl and add the red wine, sliced onions, garlic, olive oil, red pepper paste, paprika, tomato paste, and salt and pepper to taste. Mix the ingredients well in the bowl. Place the bowl covered with some plastic wrap in the refrigerator and let it marinate for 6-8 hours. Once the meat is done marinating, deskin the potatoes and place all of them in a 2 inch deep baking dish along with the chopped carrots. Remove the meat from the marinade and place it on the baking dish, pour the marinade over the potatoes and carrots. Slice the chouriço sausage into pieces and scatter over the dish as well. Pour the 1/4 cup water over the dish. Place the baking dish in the oven and let it cook for 1 hour & 30-35 minutes or until the meat is done and tender. Check to see if the meat is done and if it is, it is ready to serve. Take it out of the oven, cover with some cilantro, and serve.